"A true stocking filler in that this is the only thing in this issue that would actually fit in a stocking. Slim Ray's latest addition to his mini-publishing empire is another well presented, user friendly gem. Slim has packaged this 10cm x 15.5cm (4x6") offering as ringbound and waterproof and therefore should fit any pocket unobtrusively. There are new diagrams as well as information from the full size manual and all of it clearly presented and easily understood. Section titles are boldly listed at the bottom of each page-a sound idea for rapid reference but in the wet possibly the staircase style indexing would have made it easier to go direct to the section starts. 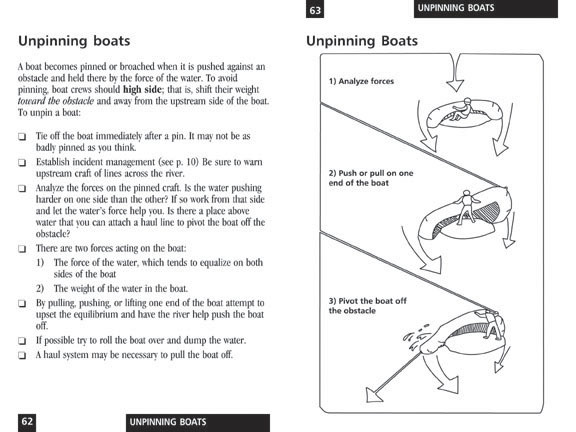 There are 49 sections covering everything from river features and cars in water to HAZMAT and knots. An excellent quick reference, truly pocket sized and therefore one of the few to be truly field-usable." Been flooded lately? Get an experienced guide! 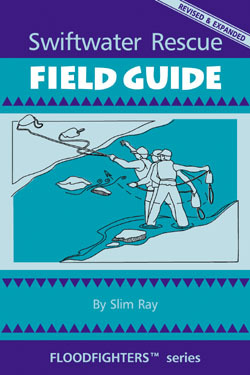 Swiftwater Rescue Field Guide is something that every emergency responder needs to have handy. This tough, waterproof 4X6" booklet is made to fit in a pocket, a glove compartment or a emergency response pack. It's the ultimate field reference to swiftwater rescue.